When Paul Simon crooned this song back in 1975, I don’t think he ever thought people would take his advice seriously. No I’m not at the verge of breaking up with someone and nor have I been dumped. I’m reshaping something I had written for The Star newspaper back in July 2014. I’m going to share with you some points that I contributed. I’m not sure if they’re the best or the weirdest but I felt they are the stupidest ways of breaking up with someone. This one makes me roll my eyes a lot, so much so that they sometimes get stuck in my forehead. What is this nonsense about? Can’t you honestly come up with something better than this age-old excuse? Yes. Now that you mention it, one probably does deserve better excuses. Do people really think such a break up line will lessen the shock or pain on the other person’s part? Whoever ends up with you is going to be so lucky. I’m going to start using expletives any moment and my editor is not going to be amused. Hopefully, when the person uses such a line to break up, all their luck vanishes down a sink-hole never ever to come back so that they can suddenly realize how lucky they were initially to have you in their life. Stop me. I’m about to swear now. 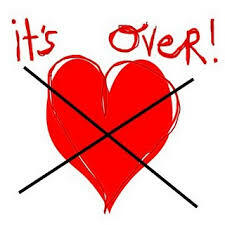 How does giving silent treatment constitute a break-up? Not replying back to texts, not answering calls, ignoring any form of communication in the hope that the person you are trying to break up with will silently go away and let you get on with your life. You are a bloody coward if you do this. Also you need to go live on another planet because no one wants to be in a relationship with a loser like you. My family doesn’t think we will make it. Now how do we even begin to make such a person change their view? Also you’re better off breaking up with such a person instead of being in a relationship with the entire family. Yes the family is part and parcel of your significant other but when they start interfering and giving opinions on your relationship, it’s best to walk away before you’re told the family doesn’t think you will make it. I could go on and on with excuses but would love to hear from you with what you might have heard or even said to get out of a relationship you didn’t want to be in. It would be interesting to know how creative you can get.